It was quite the weekend! My sister in law flew in Friday. My husband's grandfather is turning 90 today and there was a surprise party for him on Saturday. It seems like this was the weekend to plan things because we already had plans and had to turn down an invite for our niece's birthday party as well. It's weekends like these when you really wish you could disapparate like Harry Potter and get to all the different places in one day. How convenient would that be?! My sister in law ended up taking Claire with her to the birthday party. I am so glad that even though Matt and I didn't get to go, Claire was able to be there and wish her Great Grandpa a happy birthday. We were also glad she had some extra bonding time with her aunt (and that she was quite the trooper during the 2 1/2 hour car ride each way)! Hopefully we can meet up with our niece and have a mini celebration to make up for the fact that we couldn't be at her party soon, too! These are the pants that just won't quit! See them 10 ways here and recently worn here. What a busy weekend! I think we both need a weekend to recover from the weekend! The weekend sounded fun! I love those pants with the chambray! The necklace is so pretty too! Yes--I have so been there--I love having fun things to do--but hate when it means I have to choose which thing to attend :) You look adorable--love the chambray shirt! Great outfit, we had a 95th bit=birthday this weekend so we were very rushed, left no time for blogging for poor little me. Man, weekends where you're double (or triple) booked are the wildest! Sounds like you had a good one though. I love these pants with the light chambray top. And the ruffle details on the blazer you chose are adorable! love this outfit. So going to have to recreate it one day. Happy birthday to everyone. How old is your niece? I just love the dark plum pants and that you created sort of a suit look here. I am still hoping I will be able to find one exact burgundy pants of yours. Wow, you all are busy! Have you even fully recovered from your trip yet? Wouldn't that be awesome if we could be like HP? You are a mix master with those pants. Fun and busy weekend! Love these burgundy pants, they are classic but still stand out because of the rich colour. busy weekends are always fun, you look so cute as always. Happy Birthday to Claire's great grandpa! WOW! 90 it hard to achieve these days. I like the burgundy agains the chambray - so pretty. I hate when weekends are too booked and you have to figure out how to divide up your time. Wait till your daughter starts sports, it gets even crazier. love your style! beautiful as always! Cute outfit! How cool about the surprise party too. You always have the prettiest layers. So structured and put together! I love the way you layered the chambray under the jacket. I feel like it always happens you can have three weekends of the month with no plans and then suddenly four things happen on one weekend. Just crazy. Sorry you had to miss out on somethings and it would be great if we could just do it all! 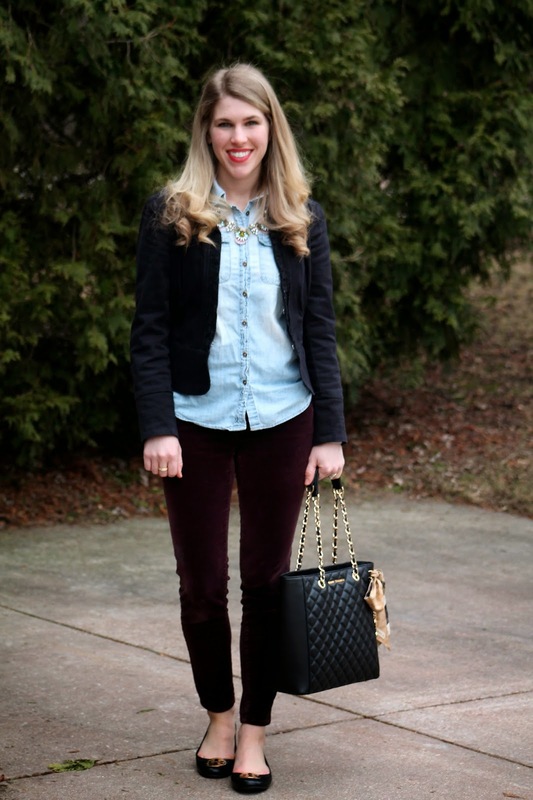 Burgundy pants and a chambray! Definitely pinned that to recreate later! It sounds like you had quite the busy weekend! Too many birthdays, so little time! You could either learn to dissaperate, or just get a time turner (had they not all been broken in OotP) and attend them both! Hahaha, I talk about wanting to apparate all the time! 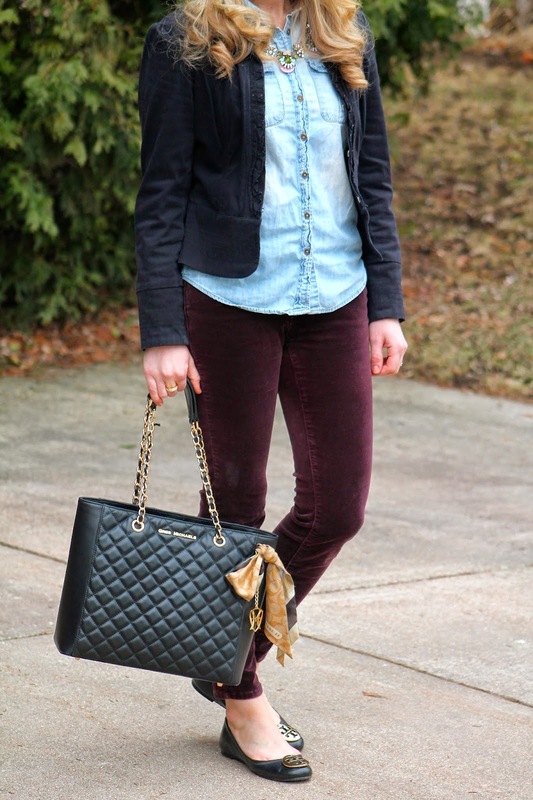 In fact, I just tweeted that I wish I could apparate so I could be real life friends with all my blog friends, ha :) I love the maroon pants and chambray shirt together, by the way - so cute!